How can you add excitement to a preschool classroom? If you are looking for a fun way to enhance your classroom, play lofts are a great choice. Hertz Furniture has many models that little ones are sure to love. This lively and inviting selection offers various ways to increase and enhance activity space without undertaking a major construction project. Reading lofts cater to children at a variety of ages and developmental stages. 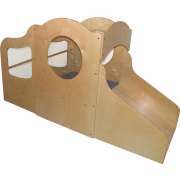 They encourage young ones to climb and explore while playing cooperatively and taking turns. 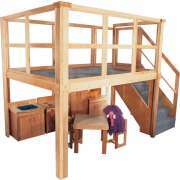 Constructed for the safety and education of young learners, your playhouse loft will quickly become a class favorite. 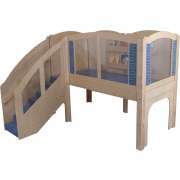 What is a play loft? Many classroom lofts are comprised of raised platforms with open space beneath. 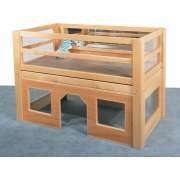 This configuration offers an easy way to increase activity space without knocking down any walls. While some children participate in an imaginative play scenario or play at an activity station below, others can ascend the stairs to find a quiet reading space, go exploring or participate in an alternative group game. In this way, many children can stay occupied for a long time in a single concentrated space. 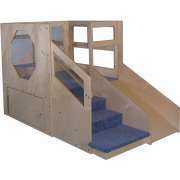 What kind of play loft can I get for pre-k or early childhood programs? Toddler play lofts are lower to the ground so the youngest students in a preschool or daycare can easily enjoy them as well. Although they might not have an open space underneath, they still provide an enticing indoor play area. 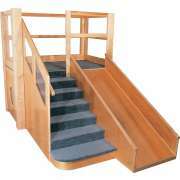 Many feature slides with high side walls for safety and balance. They also help toddlers learn how to take turns and play together. What are the benefits of reading lofts? 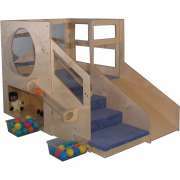 Play lofts encourage imaginative play and gross motor skill development. Their unique structures and designs lend themselves to virtually any scenario young ones can think of. 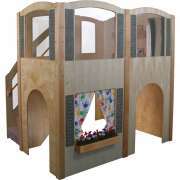 Your loft playhouse might become a house, castle and pirate ship all in one day. 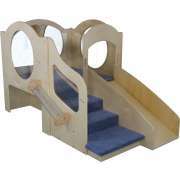 Gross motor skill development is facilitated by the ramps and steps that children are required to climb in order to reach the top. Because play lofts are so much fun, young ones will be encouraged to challenge themselves and climb to the top, thereby improving their walking, crawling or climbing skills. Although many children will be ascending and descending the reading loft, there is no need to worry about trips and falls. Play lofts are designed with the needs of developing children in mind. They feature railings that are placed at an appropriate height so young children can easily support themselves and balance as they climb. Additionally, open designs with shatterproof windows facilitate close supervision by caretakers, so they can keep an eye on playing or reading children. What can I add to make my classroom loft more exciting? Because classroom lofts are so conducive to imaginative play, you may want to consider specialized accessories. 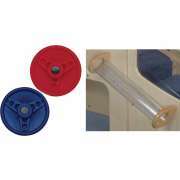 Steering wheels and tracking tubes are a lot of fun and facilitate fine motor skill development for your growing students. Some preschool lofts come with accessories such as pretend kitchen appliances and household furniture. 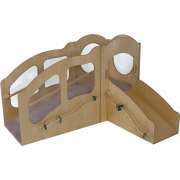 There are also options with built-in book displays and puppet theater windows. 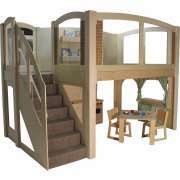 Strictly for Kids play lofts come in a variety of configurations that are appropriate for toddlers, preschoolers and even older students. 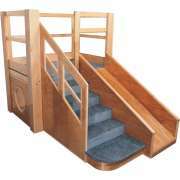 Some indoor play lofts feature ramp access, some have steps and some include both. 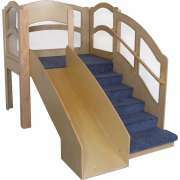 Carpeted platforms and steps provide excellent traction as kids climb and wander around the landing or reading loft. Hertz Furniture is here to help you determine which play loft configuration is ideal for your learning space. 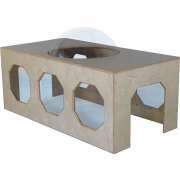 Our variety of sizes, styles and configurations includes something for everyone. When you purchase a play loft, you can be sure that you are helping your students develop many of the most important physical and social-emotional skills. 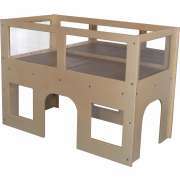 Your classroom loft is sure to become a fast favorite for hours of educational fun.